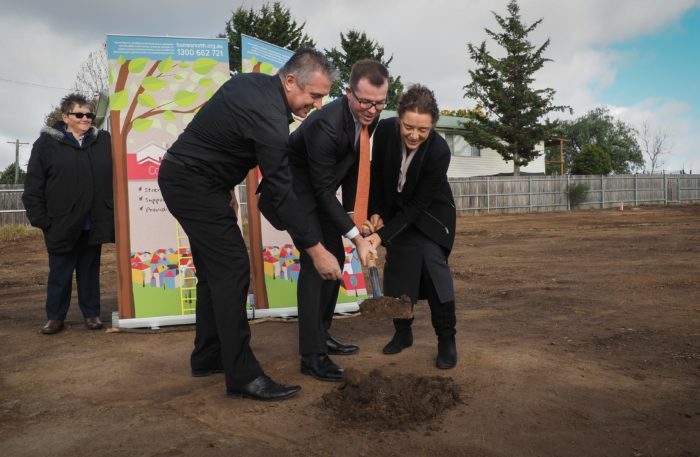 Hibbards’ Richard Stubbs, left, Northern Tablelands MP Adam Marshall and Homes North chief executive Maree McKenzie turning the first sod on the $2.1 million social housing project. HOME affordability for those in need in the Northern Tablelands entered a new phase today, as Homes North started work on six specially designed units in Armidale. Working with Hibbards Developers, the not-for-profit community housing provider has designed the $2.1 million development to address social and environmental imperatives. “This project is not just about affordable housing, but it takes a much longer view by ensuring that living in these units will be affordable through thoughtful design that minimises the need to buy in external energy,” Mr Marshall said. The project has been supported by the NSW Government, which has helped Homes North to increase its borrowings in order to supply more affordable housing. Turning the first sod of soil on the project at the Stephen Street site, Mr Marshall applauded the dedication of the Homes North staff who brought the project to its ground-busting stage, and congratulated Hibbards for its essential contribution. “Providing affordable housing for those with limited opportunities to earn an income is a big challenge for our communities,” Mr Marshall said. “Failure to do so means that we condemn people with a disability, and others in need, to a sub-standard life – or perhaps to homelessness. Homes North chief executive Maree McKenzie said the partnership between her organisation and developer Hibbards had been a breakthrough. “Hibbards have been generous and worked with us to design homes that are 6½ star-rated and energy efficient,” Ms McKenzie said. Homes North is working on more partnerships that will deliver mixed tenure housing in various locations across the New England North West. Homes North is committed to increasing the number of homes for the community that are affordable, efficient to run and of very good quality.